While Australia spent the night snoozing away, dreaming about sheep and puppies, Nintendo held a secret press event half a world away in London. They spent the short time there making a slew of announcements with most of them being unexpected at the very least. Nintendo of America president Doug Bowser had to step off the stage early on, which was also unexpected but the reason for that was revealed at the end of the show, which we’ll get to soon. His spot on stage taken up by Reggie Fils-Aimé for the duration, with the crowd letting off an enormous applause when he first stepped up. While video footage should be popping up from those who went to the event in the next day we only have images for now. But fear not, along with those we have some tasty info. Nintendo Labo Virtual Boy for Switch: Hot off the heels of the recent Nintendo Labo VR Kit reveal, a virtual reality headset made from cardboard you slip the Nintendo Switch into, we have a Virtual Boy spin on the Labo experience. 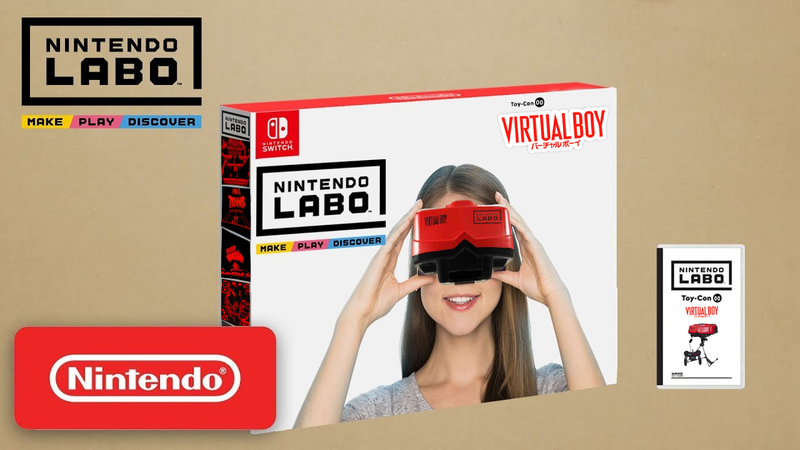 More than just a re-colouring of the VR set, the Virtual Boy version of the Labo brand stems closer to being like one of Nintendo’s popular mini edition of their past consoles. “This is more than just cardboard” stated Doug Bowser, minutes before frantically leaving the stage. “We’ve taken the guts out of the original Virtual Boy and merged it with the existing Nintendo Labo structure. You won’t just be building goggles, you’ll be building an entire console”. Reaching into a small box, he pulled out a mock up of the Labo Virtual Boy headset and held it up for the crowd to see, followed by a version of the Switch’s JoyCon Grip shaped like a Virtual Boy controller, he explained what’s different about this Labo set. “This is a blending of cardboard, plastic, the latest technology and gaming” he stated. 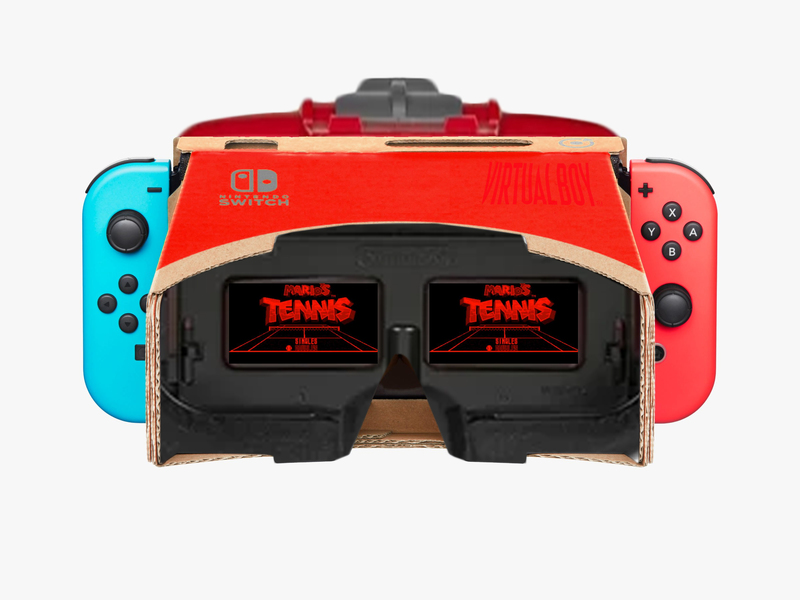 “The back has your usual Labo style cardboard base, attached to the front is a compact version of what’s inside the old regular Virtual Boy. All the internals, the look, the smell. It’s all the same”. The Nintendo Switch cartridge that comes packed in will contain five classic Virtual Boy games. The majority of them being first party Nintendo titles, with over fifteen others being released in the months proceeding as downloadable content. There’s also consideration to branch this number out, allowing developers to make their own Virtual Boy games and have them sold on the Nintendo eShop. Nintendo is also looking at having a stand to prop the system up like the original available at launch. “The added weight of the Labo Virtual Boy along with the Nintendo Switch console is on the hefty side” remarked Reggie, who had taken over for Doug who reportedly rushed out after learning that his wife had suddenly gone into labour. This reveal is very similar to one Retrospekt covered half a decade ago by the by. No release date has been set but we’ll be sure to let you know once it has, the Virtual Boy console has always been a big hit at the Retro Gaming Museums Retrospekt often hosts and co-hosts so we’re looking forward to giving this a go. Following on from the first announcement of the night we had the newest in the line of Nintendo’s very popular miniaturized consoles, this one again being a bit of a surprise. Based on the already teeny tiny handheld console from 2005, the Game Boy Micro Mini is perplexingly smaller. “Around the same size as the original Game Boy Micro screen” remarked Reggie, “This is truly a Nintendo console that you can take with you absolutely anywhere and everywhere” before pulling a Game Boy Micro out from the inside of his cheek, like a small woodland creature retrieving a nut. The journalists in the crowd gasped in confusion, cheered with joy, then cried in confusion. Powered by a small watch style battery instead of an inbuilt chargeable Li-Ion due to the Game Boy Micro Mini having no USB cable input, it was admitted the battery life will be shorter than the gaming public is used to. No exact numbers were spoken but Reggie did explain that “This is to avoid the rampart piracy that came with our Nintendo Entertainment and Super Nintendo Entertainment System Classic Mini consoles. But let me assure you that the games we’re including are thirty of the true gems you grew to love so so long ago, including one from a beloved film that also happens to be one of the most expensive licensing deals in Nintendo’s history”. 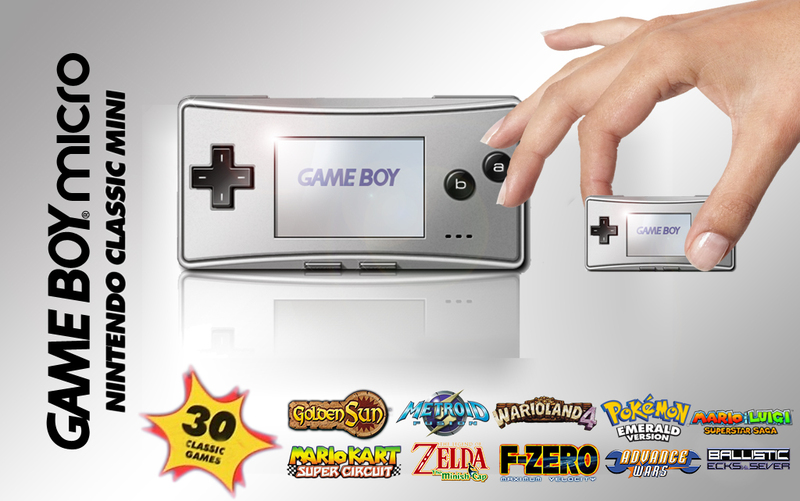 Once again a release window for the Game Boy Micro Mini wasn’t mentioned but once It’s announced, as well as the full list of the games included, we’ll let you know. Will you be picking up this lite version of a neat lite handheld? Let us know in the comments, on our Facebook page and Twitter, follow us on Instagram and subscribe to our YouTube channel, smash likes the bell YA-YEEEEEEET. As Reggie left the stage to, in his words, “Give Bowser a call about Bowser Jr.”, a Nintendo engineer from their research and development crew walked over and followed on from the Game Boy Micro Mini by boasting about the past few years and the success Nintendo has had with their classic mini consoles and handheld enabled Switch console. He spoke about how large a chunk of Nintendo’s history has been taken up by handhelds and how they’ve innovated with things like smaller and larger revisions of various console iterations. Like the Nintendo DS/DS Lite/DSi XL units of the past. Mentioning how mobile phone companies tackled similar ideas with larger and smaller smart phones and how the extra large edition wasn’t much of a thing in the 1990’s, his team wanted to go back in time and rectify that with the Game Boy Pocket XL. Or the “New Nintendo Game Boy Pocket XL” to be exact. 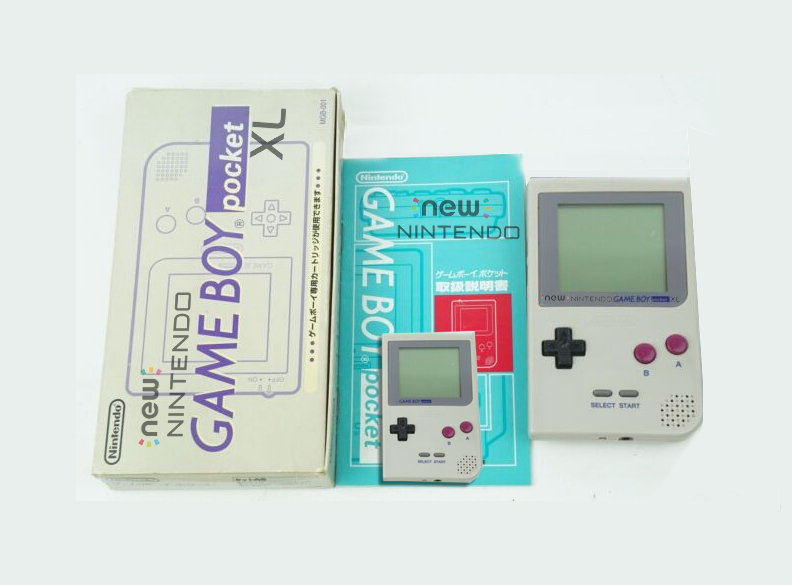 Only being shown in a single image, you can see the XL handheld on the right, the retail packaging on the left and an original version of the Game Boy Pocket in the middle for scale. This really is a big ol’ Game Boy. Or a Game Man? A Game Granny? The biggest difference besides the obvious size is the branding below the screen now being much longer and wordier. Looking to be around the same size as an Apple iPad this giant twist on the classic will be missing modern trimmings like a back light for the screen. To “Retain the nostalgic feel”. This includes being the second announcement of the night to forego the Li-Ion battery route and instead running on an unnamed but probably whopping amount of AAA batteries. It was stated that the unit will come with a fresh set of batteries thanks to a deal with Duracell though which is a bonus. With how many batteries this’ll chew through Duracell’s gonna sell a boat load of replacements. A headphone jack’s promised to be included as well as Bluetooth capabilities for wireless headphones and controller support if your arms get tired of holding the big bad boy. Which was a strange turn around from the talk of keeping things more old school but they’re welcomed features. There won’t be any inbuilt games this time, Nintendo instead experimenting with having the handheld be compatible with old Game Boy cartridges like the original. As well as running any games you already own or pick up at second hand stores and the like, Nintendo said they plan to re-release many classic Game Boy games with original boxes, manuals, inserts etc. If fans keep up interest Nintendo plan to keep re-releasing retail Game Boy titles on a regular basis. The research and development team is also working in conjunction with Samsung to create a foldable version for easy storage while traveling. The aim is to get it to fold to a quarter of the size so it can fit in consumers pockets. Best of all, due to the size of the Game Boy Pocket XL the cartridge slot will work like a CD changer. More than one Game Boy cart can be inserted and hot-swapped when turning the console on for convenience. Again, no release date has been set for the New Nintendo Game Boy Pocket XL and it was noted at the event that It’s still a long way off but once again Retrospekt will keep you up to date on any news. Reports have come out that in the final moments of the short Nintendo London 2019 keynote, right as the media folk were getting out of their seats to leave, a Nintendo employee ran over to the podium and frantically babbled something into the microphone about a special last minute live video feed. The massive screen behind the stage burst back on to show Reggie and Doug sitting next to each other. The audience again loudly applauded this. They spoke for a few minutes about what had been announced at the event, what they were looking forward to and complimented each other on their work as being presidents of Nintendo America. They were then handed whiteboards and markers and Reggie instantly started scribbling on his. 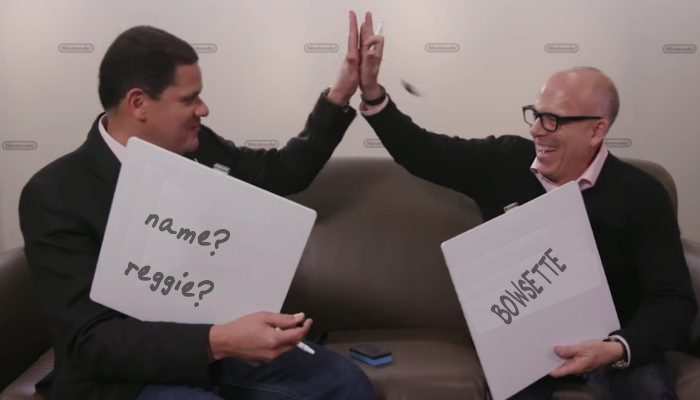 He held it up and asked Doug Bowser about his child who had been born less than half an hour earlier and Doug announced that he was the father of a healthy newborn girl. After congratulating Doug many times Reggie went on to ask about names, especially “Lil Reggie” or “Lil Regginator”. This was when Doug quickly gave away the babies name. That was it for the short but eye opening show that was Nintendo London 2019, thanks for reading and we hope you enjoyed the coverage. Again we’ll be sure to update you with any news post-event though our website, Facebook page and Twitter, also follow us on Instagram and subscribe to our YouTube channel. Video footage from the keynote should be dropping sometime April 2nd. Previous ArticleRetrospekt.com.au is now Retrosports.com.au! Sports Haiku Episode One! Next ArticleYorKON 2019 is GO!